The Bachelor Juan Pablo Galavis Apologizes TWICE - Did GLAAD Write His Second Apology? 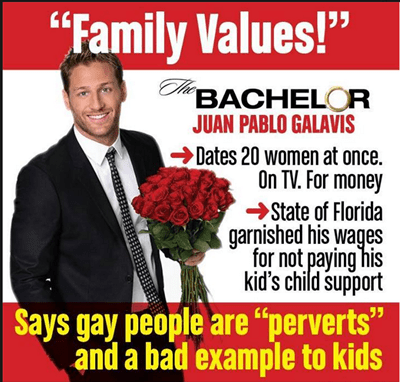 Home/Entertainment/The Bachelor Juan Pablo Galavis Apologizes TWICE – Did GLAAD Write His Second Apology? So here we have Juan Pablo blaming English being his second language, his comments being taken out of context (even though there is audio), and or course stating that he has “gay friends” to get out of it. One has to wonder what context J.P.G. actually meant to use the word “pervert?” in. Of course this apology only happened after GLAAD possibly smelling money from ABC reached and some free publicity reached out to J.P.G. and then reported his apology on their website which is totally different than the apology above that Juan Pablo Galavis posted on his Facebook page. Whats really interesting is if you read the Facebook apology and GLAAD’s version even though they are different don’t even sound like the same person wrote them. Do they? Did GLAAD help write this apology specifically for their website and release? Of course Juan Pablo will be meeting in Los Angeles this week with Monica Trasandes, a leads GLAAD’s Latino and Spanish-Language Media Program, and GLAAD’s Wilson Cruz who never met a piece of publicity he didn’t like. CREDIT: The above J.P.G. meme was created by Scott Wooledge. Zac Efron Talks Gay Rights, Potential Gay Movie Roles, And Addresses His Gay Fans! That is not an apology.. that is simply a confirmation of what was said! “taken out of context’ means that what was said was correct, and intended as such, only the pre- or after-lines were not right……. Do we come across as fools? Too much so-called apologies have been said lately after insults and denigrating remarks have been made! The word “sorry” has lost its value and meaning, it is used to easily and too often by people who deep down (or not so deep down…) are in fact bigots! Well, I’ll be a head-cutter, one insult too much!